A: Full, rich, lingering flavor aside, we chose avocado oil for its fat composition, phytosterols and polyhydroxylated fatty alcohols, all of which are anti-inflammatory in nature. Avocado oil is also notably high in vitamin E and monounsaturated omega-9 fatty acids. In a recent study, both high and low doses of avocado oil enhanced alpha-carotene, beta-carotene and lutein absorption from a salad by as much as 15 times compared to a salad without avocado oil. Q: How is your rosemary extracted? A: Our current rosemary extract for the mayo is extracted by supercritical fluid extraction (CO2), without harsh chemicals such as hexane, and it is dissolved in organic olive oil. Q: How are your natural ingredients sourced? Through our agricultural assurance program, we take steps to ensure our naturally-sourced ingredients provide you with the confidence that your finished food and beverages are safe and compliant. Products are only grown in the USA and meet or exceed the latest standards in food regulatory compliance. Many of our raw materials are vertically integrated and sourced from only approved suppliers. The company routinely visits all major sourcing countries to ensure standard practices are followed. As a result, we are using the highest quality raw materials. Using various sources also allows us to avoid the risk of supply disruption, further ensuring our customers are receiving consistent and reliable food ingredients. Q: What are expeller pressed extracts? The expeller-pressed spice and herb extracts are made by a patented, carefully designed process intended to capture the true essence of nature. These spice and herb extracts are manufactured in the U.S. and maintain the highest standard in color, flavor, and composition. In addition to meeting rigorous quality and environmental processing standards, the company’s expeller-pressed spice and herb extracts provide high impact color and flavor profiles. These expeller-pressed extracts are solvent-free, Whole Foods® acceptable, organic suitable and are an appropriate alternative to CO2 extracted materials. A: Yes! We understand that some cage-free eggs are housed next to caged chickens, however, our eggs are sourced from 100% cage-free farms. Our chickens are fed 100% non-GMO corn and soy. Q: I have an allergy, are the mayos manufactured in a facility that contains dairy, eggs, or nuts? A: Yes, our mayo is manufactured in a shared facility and on a shared line with other products that contain the major 8 allergens. While they do practice safe cleaning procedures in-between runs, we still recommend caution if there is a zero tolerance. Q: Is the salt in your Mayo Iodized? A: No, the salt used in our Mayo is not Iodized. The sea salt for our Mayos come from the eggs salted by the supplier and do not contain anti-caking agents. There is no added sea salt. Q: It has a tangy, salty taste. Why is that? A: Because the eggs are organic, they have to be stored in salt so that they don't go bad. We don't add salt. That comes from the fact that the eggs have to be salt up to 10 percent to give them the shelf life in the manufacturing process. Q: What constitutes the protein in the Mayo? Our mayo is made up of 75% avocado oil and the serving size for mayonnaise is determined (by the FDA) to be 1 tablespoon. Our mayo has the highest egg percentage of any mayo on the market that we're aware of; however, it still only makes up a small portion of the formulation, especially when you break it down into 1-tablespoon servings (it comes out to less than 1 gram of protein per tablespoon). 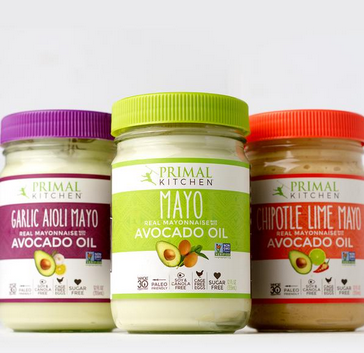 Primal Kitchen Mayo contains such minuscule amounts of carbs, sugars, and protein that legally we cannot claim it on the packaging. However, if you do your own research on the nutritional information on eggs (for instance, in 1 raw egg (50 g) there are .4g of carbs and .4g of sugar depending on where you look) you can come to some sort of calculation to figure out how many grams of each macronutrient there are in the entire jar. Our mayo contains 13% whole egg and 7% egg yolk. It contains 1.5g of Polyunsaturated Fats and 8.0g of monounsaturated fats per serving of Mayo. Vitamin K is .01 mcg per serving (1 Tbsp). Q: I see your mayo is Kosher. Who is it certified by? A: Yes, our Mayo is Orthodox Union Certified. These products are manufactured under the supervision of the Kashruth Division of the Orthodox Union and are kosher when bearing the symbol OU located on the label. A: Primal Kitchen Mayo is good for 9 months, unopened. (We dare you to attempt to keep a jar that long.) After you open your jar of mayo, please refrigerate and consume within 60 days of opening. Q: Is your Mayo NON-GMO? A: Yes! Our Mayo is Non-GMO Project Verified! Q: Is there heat used is the manufacturing of the Mayo? A: There is no heat used in the process. All ingredients are safe to eat as-is. The eggs are pasteurized already. Q: Do you use yeast in the making of your vinegar? A: Yes, we do include yeast as an ingredient in the fermentation process, but there is no yeast remaining in the final vinegar. A: If you live in a cold climate, your product may arrive frozen. Mayo will freeze in transit if temps drop below freezing and the product will separate. Real food ingredients separate! If you live in a cold weather climate please Do Not purchase mayo until the temperature warms up. Even if it is warm where you are, please take into consideration the temperatures the Mayo may have to travel through to get to your region. While it's certainly not the intended Primal Kitchen mayo experience, if the mayo separates, it's perfectly safe to consume. We could have chosen fillers and artificial preservatives to avoid this issue, but we don't think it's worth the sacrifice. Q: What is the Cold Weather notice? A: Because our mayo is a real food product and we don't have any artificial thickeners or preservatives, the emulsification will break in temperature fluctuations. The sacrifices we make to provide you with a tasty mayo with no junk in it! This means that during the winter time if you live in a state that gets very cold or freezing, the mayo will most likely freeze in transit to you. We don't want our mayo to arrive separated to you because we want you to enjoy it in it's intended state, so we recommend holding off on purchasing this until the Spring time!